Which mic - what are the differences? Like my other post on preamps here's a grapahical representation on the colouration of different mics on a given source. Again not my work. We can thank Dan Richards for this one too. Very interesting Trev. Is this standard or subjective? And while I know not every mic under the sun can be included, where is my newly-bought-but-yet-to-use Rode NT1-A? Everything is subjective to some degree as everyone's ears perceive things differently but this gives something of an objective benchmark. The NT1a is in the top quartile I'd say but you'dd have to actually a/b it with a few others to place it exactly. Actually I think the chart is right on for the most part. I disagree with the placement of a couple of the mics, but it's pretty reliable otherwise. Sorry if a dumb question but what do the four category titles mean? umm. What is it you don't understand? 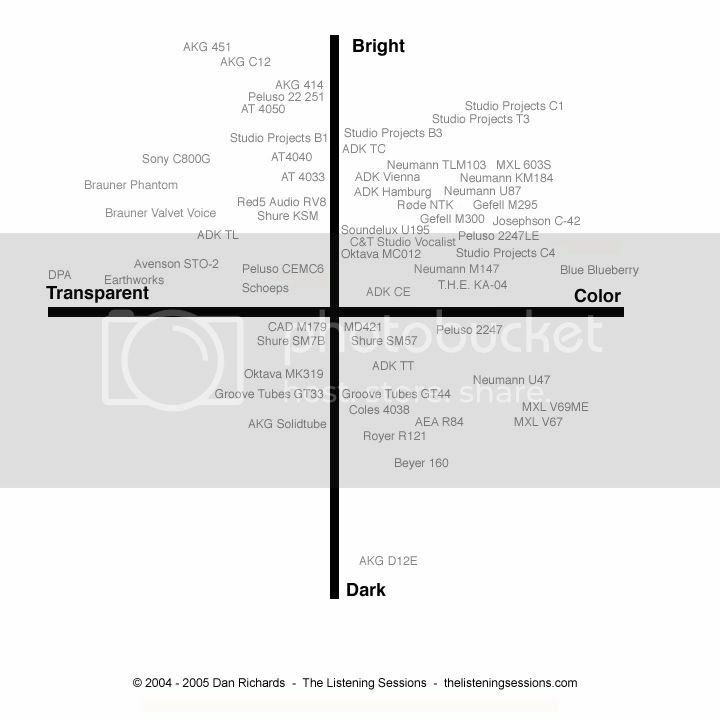 Transparent means the mic just captures what it hears where as color [sic] means it colours the sound in some way. Trev,that's a very usefull ball park diagram.What would be really handy is to say what different mics would make to a style of music.We all know the Shure sm57 is great for rock,and pretty much ubiquitous in all studios.What I don't know is what mic would be best suited to say a vocal that is deep down Paul Robeson territory,or a flighty shrill voice.What mic picks up a percussive bass best to bring out the ring,and not the thud of the strings.That's where someone like you with all their studio experience of using different mics and knowledge come in.SOS article commission would be good idea. I have one mic and it's all those things. Ahhh, that's where it gets complicated and, to be frank one of the big differences in recording in a pro studio versus a home studio. You cant really say 'x' mic for 'y' type of music on 'z' instrument (of course you can 'make do' but that won't give you 'best' results (subjective obviously). The key is matching the mic to the requirements of the song, the requirements of the instrument, the requirements of the room etc. Difficult to explain what I mean in every circumstances but here's an example: let's say you get a band in and something in the chain is giving you something annoying in the high frequencies (that might be any of the factors mentioned above), if you can't tame the source sound you might use a ribbon mic to do the job for you. Make sense? It's all about context. Another example, you are busy tracking this band and they have another guitar line that you weren't expecting. You need to think about where you will 'place' that in the mix. Your choice of mic and how you position it will have a substantial effect on that. Think of putting a song together like the pices of a jigsaw. Unless the band are very good they may not have thought about how it will all fit together sonically in a mix. You will probably have to help them do that in the way that you record and mix it for them. I'm thinking about running a workshop on this stuff at some point. If you might be interested let me know.